The 9/4 favourite Sariska edged out Midday in a thrilling finish to the Investec Oaks. Trainer Michael Bell is in no rush to commit to future targets for Sariska after his admission to an exclusive Epsom club. Only six current trainers - Jim Bolger, Henry Cecil, John Dunlop, Aidan O'Brien, Sir Michael Stoute and Saeed bin Suroor - have won both the Oaks and the Derby. “She got quite a nasty cut on her hind leg and sometimes these things can flair up and get bruising so we can’t set any plans in stone,” said Bell. “But these good horses are much easier to plan for. Potentially we could go for the Irish Oaks but if she needs more time she could wait for the Yorkshire Oaks. 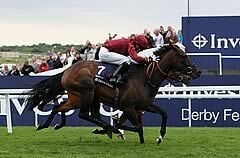 “Looking ahead to the autumn, she’s not in the Arc - but she could be put in - or she could go for the Prix de l’Opera. We’ll talk about the St Leger but my gut feeling is that we’d stick to a mile and a half and I’d be very happy to drop her back to 10 furlongs. The Breeders’ Cup is something else we could talk about, it’s a long way off and can be expensive to run there. “All our options are open. It’s up to Carole (Bamford), Hugo (Lascelles) to and everyone to decide but it’s a lovely position to be in, to be able to sit around and discuss things like Arcs and Breeders’ Cup. “But she should improve as she gets older, her mother did, her sister did and her father’s stock tend to. “We were worried because the stewards’ enquiry was going on for such a long time but I was not too concerned when I saw the actual replay because I couldn’t see anything that worried me. “Sariska has a wonderful temperament and I know all Lady Bamford’s trainers were eyeing her up as a yearling so we’re lucky she came to us. "She (Sariska) has done it well. She was travelling well and they went a good gallop. I could see Jimmy (Fortune) right down my inner and I said that if she was going to beat me then she was going to have to stay. On watching the replay: "Jamie’s got the stick in his right hand, which is the correct hand. Personally, I think that when she jinked right, Jamie had his whip in the correct hand and I would be very surprised if anything happens. "It will be interesting to see what Jimmy Fortune says but I would hope that we would be alright. Sariska has come back with quite a nasty cut on her off-hind leg - it’s serious enough but it shouldn’t hold us up too much - so it was obviously quite a rough race. "She has been a fantastic horse and I have always had huge confidence in her. You can see what a star she is to look and to bag the Investec Oaks, it’s an amazing feeling. "It’s a lonely place in front for horses, especially one like her because she is relatively inexperienced. The winning post came just in time and credit to Midday - she has run a fantastic race and Henry may have been a more popular winner! "What a thrill! There’s a whole team behind her and we all love her. She’s such a lovely, lovely, super filly, very laid back, and we couldn’t be more thrilled. There’s a terrific team behind her. "It’s the first time that I have been to Epsom and I am just shaking because I can’t believe it’s happening - it’s unreal. I couldn’t have happened to a more lovely filly and a great team. I’m so thrilled. "I thought that they might have gone a bit quick for her because she’s quite a big filly and quite laid back. She’s never been to Epsom before and we didn’t know how she would handle the turn and coming downhill. But she just gathered momentum and kept going. "I didn’t think that we had actually won and I thought that we had just been pipped on the line but luck was on our side." Henry Cecil came within inches of a ninth triumph in the Investec Oaks as the Juddmonte homebred Midday was beaten a head by Sariska after some hurly burly in the last few furlongs of the Classic. As she tried to make her run, Sariska was squeezed on both sides by Phillipina and Wadaat, who had raced prominently in the early stages but dropped out very quickly after rounding Tattenham Corner.